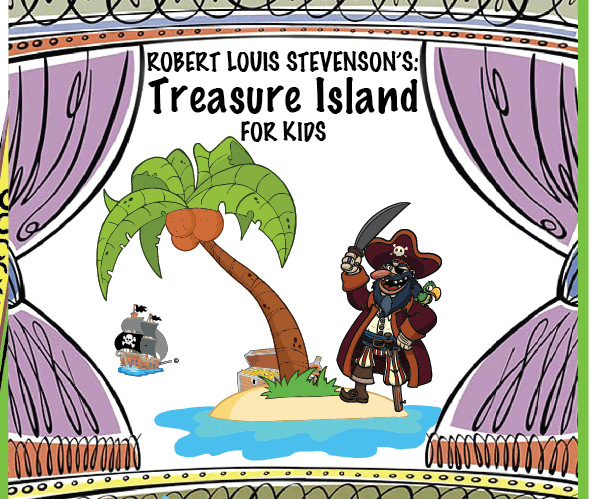 Treasure Island for Kids is here! These are the late nights. Writing Robert Louis Stevenson’s Treasure Island for Kids has been a BLAST! Possibly because it is my first foray outside of Shakespeare, possibly because it is about pirates (I mean, who doesn’t want to write about pirates, right?!?!) or possibly it’s because when it comes down to the launch of a new book, it’s always exciting! But, it’s finally here! It’s also great fun to see it all come together. From the story, to the cover art (which has to “paint the picture”) to the editing… there are several pieces and people in play, and they all help create the “final sculpture”. Well, I have rambled enough today, and I hope you like my rendition of Treasure Island, I know my kid has!